When we were young, we used to frequently listen to â€œChun Chun Karti Aayi Chidiyaâ€ from AB DILLI DOOR NAHIN which used to be played on the Radio almost daily. The other hit song in those days was â€œNanne Munne Bachhe Teriâ€ with Asha in BOOT POLISH. The later especially had good lyrics and moral lesson for young children. When we grew up we had a wonderful Lori â€œMain Gaoon Tum So Jaoâ€ from BRAHMACHARI. This song I consider as one of the best Lori to be ever recorded and picturised on Indian Film Industry. Filmed on Shammi Kapoor, the song was in two parts, one happy and the other sad version. â€œTu Hoke Bada Banjanaâ€ from KHANDAAN was another lovely song where a poor and invalid father sings to his infant son and tells him how unfortunate that the lucky child is born in his poor house, how to manage life, how he has to struggle and fight in his life with his two hands, how to treat his neighbours, how he should take care of his mother, etc. etc. Picturised on Sunil Dutt, one can easily become emotional while listening to this song. What was the common factor in all these above songs, of course, the Singer was our beloved Rafiji. In fact Rafiji came into prominence only with a children song â€œTera Khilona Toota Balakâ€ in the forties. The other Rafi songs in this category were â€œAaj Kal Me Dhal Gayaâ€ from BETI BETE, â€œAayee Hai Bahareâ€ from RAM AUR SHYAM, â€œHum Bhi Agar Bachhe Hoteâ€ with Asha from DOOR KI AWAAZ, â€œO Nanne Se Farishteâ€ from EK PHOOL DO MALI, â€œTumhare Hai Tumseâ€ with Asha in BOOT POISH, â€œChacke Me Chackaâ€ from BRAHMACHARI, â€œSunlo Sunata Hunâ€ from ANDAZ, â€œAao Tumhe Pyaar Karna Sikhanduâ€ from SHATRANJ, â€œYeh Kaisi Maineâ€ from RAKHWALA, â€œGori Jara Hansde Tuâ€ from ASLI NAQLI, â€œZindagi Hai Kya Sun Meri Jaanâ€ from MAYA, â€œTaare Taare Kitne Neela Gagan Pe Taareâ€ from AAP AAYE BAHAR AAYEE, â€œChirag Kisake Ghar Ka Haiâ€ from EK NAARI EK BRAHMACHARI, â€œBish Chachaâ€ from YARAANA, etc. etc. â€œMeri Awaaz Sunoâ€ from NAUNIHAL was another beautiful song for an award winning movie, especially listen to the line â€œThak Gaya Hun Muzheâ€. When Rafiji sings the word â€œThakâ€ he actually shows his tiredness in his voice itself and that is called putting meaning into each and every word. Another song with message for children was â€œHum Laye Hai Toofan Seâ€ from JAGRUTI. Of course, the song â€œTu Hindu Banega Na Musalaman Banegaâ€ from DHOOL KA PHOOL has been discussed, debated and appreciated very much including in the present web site. â€œBache Me Hai Bhagavanâ€ from NANHA FARISHTA with Rafiji, KK and Mannadey was one of the few songs, where three stalwarts came together. This song is so beautifully written that each religion sees his Bhagavan or Jesus or Allah in the child and also sees Geetha, Bible and Quran. Alas, now a days, such lyrics are hardly written. Rafi and Mehmood came together for a wonderful song â€œSazi Rahiâ€ in KUNWARA BAAP. Usha Mangeshkar and Saathi sang â€œChanda Ko Dhoondane Sabhiâ€ in JEENE KI RAAH, a few lines of which was sung by Rafi also. Another unique song in this category was â€œHaina Bolo Boloâ€ form ANDAZ sung by Rafi, Suman and others. TUM HASEEN MAIN JAWAN, had a wonderful song by Rafi â€œMamta Ki Ho Tum Koi Mooratâ€ in which movie KK also sang the hilarious â€œMunne Ki Ammaâ€ which used to be aired on Radio regularly in those days. Other good songs sung by other Singers which can be bracketed with the above category of quality songs are â€œMuskura Ladale Muskuraâ€ from ZINDAGI by Mannadey, â€œRaat Gayi Phir Din Aata Haiâ€ and â€œTahar Jara O Jaanewaleâ€ from BOOT POLISH by Mannadey and Asha, â€œSaare Ke Saareâ€ from PARICHAY by KK and Asha, â€œInsaaf Ki Dagar Peâ€ from GANGA JAMUNA by Hemant Kumar, â€œTuzhe Sooraj Kahun Ya Chandaâ€ by Mannadey in EK PHOOL DO MALI, â€œTeri Bachapan Ko Jawani Ki Dua Deti Haiâ€ in MUZHE JEENE DO, one of Latajiâ€™s best songs of her illustrious career, â€œJeevan Me Tu Darna Nahinâ€ from KHOTE SIKKAY by KK, Suman Kalyanpurâ€™s â€œNanhi Si Kali Meri Ladliâ€ in DIL EK MANDIR, Latajiâ€™s â€œSunle Bapu Ae Paigamâ€ in BALAK, â€Mere Paas Aaoâ€ by AB for MR. NATWARLAL, Mukesh and Latajiâ€™s â€œIchak Danaâ€ in SHREE 420, Talat and Ashaâ€™s â€œChali Kaun Si Deshâ€ in BOOT POLISH, â€œTeethar Ke Do Aage Teetharâ€ by Asha and Mukesh in MERA NAAM JOKER, â€œDaadi Amma Daadi Ammaâ€ from GHARANA, Latajiâ€™s â€œTumhi Ho Mataâ€ from MAI CHUP RAHOONGI, Aarti Mukherjeeâ€™s â€œNaani Teri Morni Koâ€ from MASOOM, Geeta Duttâ€™s â€œNannhi Kali Sone Chali Hawa Dheere Aanaâ€, â€œRona Kabhi Nahi Ronaâ€ by KK and Saathi for APNA DESH, â€œChupa Chupiâ€ by Mannadey and Lata, KK and Lataâ€™s Do Pehlu song in LAKHON ME EK – â€œChanda Ho Chanda Kisne Churayi Teri Meri Nindiyaâ€, KK and Lataâ€™s â€œAari Aa Jaâ€ from KUNWARA BAAP, â€œNannha Munna Rahi Hunâ€ from SON OF INDIA, â€œDesh Ka Pyaara Subka Saharaâ€ by Asha, â€œDuniya Ke Log Kitne Ache Hoteâ€ from DREAM GIRL by Asha, Latajiâ€™s â€œChanda Hai Tuâ€ from ARADHANA, â€œGudiya Humse Roothi Rahogiâ€ from DOSTI and â€œApni Apni Biwiâ€ from DO RAASTE, â€œBache Manke Sacheâ€ by Lataji from DO KALIYAN were also popular songs in those days. I wish the children of today are able to appreciate and enjoy such above songs which are especially meant for them. I also wish the MDs, Lyricists, Singers and actors put in efforts to give some such above songs for Children of the present generation. This entry was posted on Thursday, November 29th, 2007 at 6:15 am	and is filed under Meri Awaaz Suno. You can follow any responses to this entry through the RSS 2.0 feed. You can leave a response, or trackback from your own site. the greatest singer ever , many have come gone he is one in a million . great songs voice fantastic . I don’t know from where I should start.First I should be thankful to that begger whose singing inspired Rafi Sb.to become a singer at a tender age of eight only.For any singer there must be some limitation at any point any raag.How can a singer be king of all types of song all raags etc.If talk about classical song instantly Manna da’s name flashes,but here also we remember Madhuban mein Radhika naache re,O duniya ke rakhwale & a lot,where we conclude king of classical as Rafi Sb.Everybody knows yedling by KK,but again started by Rafi Sb.It was god’s arrangment that gave us Naushad,Roshan,Sahir,Shakeel,Hasrat,Shailendra etc along with more than the real diamond i.e.Md.Rafi Sb. If anybody wants to write about him,I am sure if he will write his whole life even then it can’t be completed.God’s best gift at right time and right place.If he was a gem as a singer,at the same time he was gem of a human being.He helped lot of artist’s family financially in his life. Jab tak chand aur suraj rahega tabtak Rafi sb.rahenge.Allah unhein jannatul firdaus me jagah atta fermaye aameen.Sorry for long comment,but unstoppable. who will not like a divine voice aditi ji.. post no. 31……………..
rafi has the divine voice and hence it’s so popular even today. the voice itself is so divine and pure that music connossieurs will always ask for more. the result is rafi saaheb is an one man industry in himself giving bread, butter and jam to many many households – around the globe. just like the ambanis, tatas and others. more, there is never a second in which rafi songs are not played anywhere and the voice is so pristine, the notes so melodious and the man himself a great mover and shaker of innumerabe souls – everywhere. it’s bliss multiplied manifold. let the rafi magic grow to greater glory, so that rafi lovers can partake the feast of his songs – in this lifetime itself. IT is said, and it is often observed in practice, that a true Muslim has a heart full of great compassion and kindness. And Mohammed Rafi was a true Muslim who embodied ‘rahim’ in his personality. All reports on the human side of this great singer with such a powerful voice and feeling during singing, show evidence witnessing to his broadmindedness and kind disposition regardless of circumstances. Yet it is true that some colleagues of his, in the cine trade, fell out with him, which was due to the other side’s misjudgment since some of them restored friendship with him at their own initiative. i am always sing him. for me the best rafi song for kids is’gori zara hansde tu’ wow what a song the way rafisaab has expressed devs on screen feelings is impeccable.a true genius at work nobody in the HFM has ever sung a song like tht. a true gem of a song. songs like -‘aaj kal main dhal gaya’ and ‘main gaon tum so jao’ r filled with emotions.two great songs..!! “Aye Hai Bahar Mite Zulm Sitam” from Ram Aur Shyam picturised on Dilip Kumar, “Tare Kitne Nil Gagan Pe Tare” from Aap Aaye Bahar Aaye picturised on Rajendra Kumar, “Re Mama Re Mama Re” from Andaz and “Chakke Pe Chakka Chakke Pa Gaadi” from Barhmachari picturised on Shammi Kapoor sung by Rafi saheb. “Lupu Supu Lupu Supu Jao Na” by KK from Do Anjanee picturised on Amitabh. Thanks Mr. Gurumurthy for the article. Some of the best ones I recollect is chakke pe chakka from Brahmchari composed by SJ, re mamma remamma re and haina bolobolo from Andaz composed by SJ. typically Rafi had pronounced the lyrics in the modeto impress children/ End of the day all sections of the society enjoyed it. Thanks for higlighting a new dimension of Rafi. Well done Gurumurthy Sahibre….. what next? 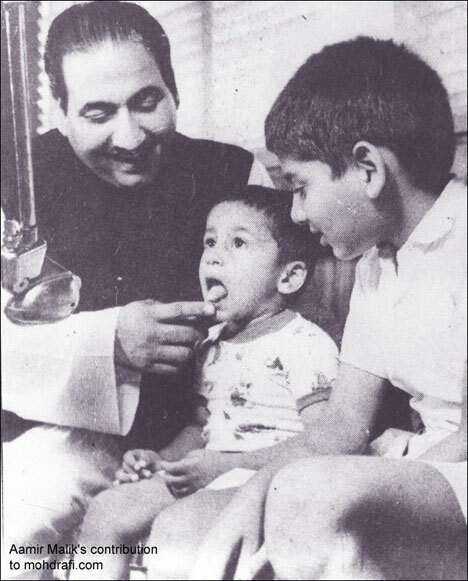 Can u pl send the urdu alpahbetical order sung by Rafi saab for kids? This is because iam trying to learn urdu. It is so refreshing to learn that there are people like me/rather better than me in picking up nuances of great musical personalities. I for one has an inherent enchantment of melodies irrespective of what language they are. I was watching Meri Soorath Teri Aankhen of Ashok Kumar. The song Tere bin Soone Nayan Hamaare” it is so mesmerising i.e the Genius Ashok Kumar’s lip sync and Sitar play and expression, then Asha Parekhs’s coyish dance and appearance, SD’s Music and Rafi vocals. What a class. Is it possible for any one to quote the name of the Santoor player who’d accompany SD for his songs? One day it will come out..
One more song from Rafi Sahib from film DEVI :LOLY POP LOLY POP. Binuji, I’m really surprised to hear that Rafi saab sang “sajna barkha bahar aayee”. Are you talking about Salil da’s all-time Lata classic in Parakh? If so, I’d request you and mr. korti not to publish the song on this site, at least not yet. I have my own reasons, which I’ll share with you in private. I am so sorry that i dint see the responce of sri milon gupta jee’s nephew & also of arnob sanyal. thank you very very much to remind me haldar da. i saw it and it has a lot of information . once again thank you very much haldar da. Reg post # 12 of Binus2000, I think Rafi sahab did not sing Mukesh Sahab’s song, “Saranga teri yaad mein, nayen huwe bechain”. Only beginning wordings is same “Saranga teri yaad mein”, rest of the lyrics and composition is totally different. For example, “Tasveer banata hoon teri khoon-e-jigar se”. sung by Rafi sahab and “Tasveer banata hoon, tasveer nahin banti”. sung by Talat Mahmood sahab. Beginning wordings are the same of these two songs. In this case you cannot say that Rafi sahab sung Talat Mahmood sahab’s song or Talat Mahmood sahab sung Rafi Sahab’s song. And as you written, you can not find those lines “din katte hai na raain; in Rafi Sahab’s song. Rahi chalte hain ke rahain chalti hain? Jelti hai batti ke deep jalte hain? Jo bhi theek theek betaye ga. I don’t know the name of film. Can any one tell me? I’m not sure if you noticed it, but someone responded to your query on saikat mukherjee on the sj thread. Also, milon gupta’s nephew responded in post no. 37 on the same thread. HE HAD BEEN PLAYING MOUTH ORGAN FOR LAST 40 YEARS & ASSOCIATED WITH HMV. RECENTLY HE HAD BEEN FACILITATED BY HMV ON THR EVE OF DURGOTSAB IN CALCUTTA â€œSHAARAD ARGHYAâ€. HIS NUMBERS HAD BEEN COMPILED BY HMV (20 SONGS) IN A CD & RECENTLY A CD WITH COMPILATION OF 50 SONGS PLAYED BY MR. MUKHERJEE IN MOUTH ORGAN. IF YOU WANT TO HARMONICA PLAYER, I WOULD RECOMMED TO LISTEN ONLY MILON GUPTAâ€™S & SAIKAT MUKHERJEEâ€™S NUMBER. AS THEY ARE PERFECT, THEY DO NOT PLAY HARMONICA, THEY SING THROUGH HARMONICA. FOR MILON GUPTAâ€™S NUMBER ONE MAY VISIT (HMV/rpg saregama site) ENROLL, & THEN SELECT THE NUMBER (AT PRESENT 34 SONGS ARE THERE IN THE SITE) & ORDER THE CD. SAIKAT MUKHERJEEâ€™S SITE IS UNDER PREPARATION AS TOLD BY HMVâ€™S PERSONNEL. ABOUT 100 SONGS PLAYED BY HIM IS EXPECTED TO BE UPLOADED. I WOULD REQUEST YOU TO FLOOD HMV WITH REQUEST MAILS FOR THIS SITE & ALSO UPLOAD SOME MORE NUMBERS OF MILON GUPTAâ€™S ALSO. and the song is in circulation. rafi historian and the most outstanding writer on rafi saab. Binu Nair…. the rafi foundation… Mumbai..
O NANHE SE FARISHTEY, one of the best songs by Rafi Sahab from ek phool do maali, is my all time favourite. the song is by a father who cannot own up his own son but the obvious genetic bond is evident from the way the song was picturised and the child artiste too did a wonderful job. rafi sahab had packed all the emotions while rendering the song. and shaily shailendra whose birthday falls on dec 9th. aayi, written by shailendra and rendered by rafi saab. will be sung by raju korte.. the ardent rafi lover. the rafi foundation invites music lovers to the event. ‘free passes’ for the event even though we may wish to do so. Your article was very nice.children have innocent faces. magic with his voice which is touching our heart. satisfaction while hearing his songs.Long live Mohamed Rafi Saab. you have mentioned a very good number rendered by our rafi sahab. the song ‘ o mere pyaro ‘ i heard it in my child hood a good number of times. what a pleasant rendering by rafi sahab. ashok ji we are so fortunate to have heard such inspiring numbers. rafi sahab aap amar ho……………………..
Undoubtably Main Gaoon tum soo jao was one of the best loris ever composed…..Another unforgettable Lori sung by Rafi Saab was from the Film Koshish. Sooja Baba Re. Then there is also a vintage Rafi saab’s Alphabetical song….. Alif zabar Ah, Alif zaer Eh, Alif pesh Oh. I remember having seen a film called “Zamin Ke Taare” in my childhood which had a very beautiful title song, “O Mere Pyaro Zamin Ke Taaro Jaana Hain Tumko Kahan….” something like that. It was a B or C grade movie with unknown star but famous child artist if I remember well, Daisly Irani. It had music by S. Mohinder and the song I have mentioned is sung by Asha Bhosale & Kamal Barot along with our beloved Rafisaab. I also remember that this song is sung by hero of the film – a truck driver with two cute child artistes who have lost their mother. Haven’t heard this song for years. I wish other Rafisaab fans will definitely recollect this song along with me. Another beautiful song which can be included is, “Juhi Si Kali Meri Laadli Naazon Ki Pali Meri Laadli” by Suman Kalyanpur in the film Dil Ek Mandir. Nice and interesting article, Rafi Saheb as usual sang children’s songs so nicely. Kids enjoy Rafi Saheb’s songs. The song – Sun le bapu yeh paigham.. from Balak is sung by Suman Kalyanpur, and not Lata. A lovely and interesting subject Mr. Gurumurthy. Sure, Rafi Sahab had sung those songs for children with so much affection and liking. His stress on some of the words for e.g. in “sunlo sunata hun tumko kahani” each word is given a special stress and in other songs too shows his involvement not only in the lyrics but also the mood of the song and its picturisation. Wonderful study by you Mr. Gurutmurty and these songs were so very beautiful. alas, we miss such compositions and songs in today’s films. Unfortunately today’s children are deeply influnced by Western culture. They have costly likes and dislikes, which puts a lot of burdun on parents in their up bringing. To add one song for children sung by KK and Andhaa Kaanon – “Rote Rote Hansna Seekho”. Both the happy and sad version are good. 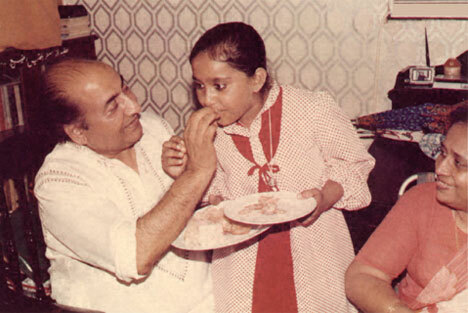 From Andaaz there is another Classic – “Hai Naa Bolo” sung by Rafi, Suman and child singers. One more from Dard Ka Rishta – “Kaun Hun Main Kya Naam Hai Tera” sung by Lata Ji.